This Kimberley spear point was collected in northwestern Australia at Point George IV in 1910. It is bifacially flaked. The edges are serrated and it has a very sharp needle-like point. This Kimberly point is made of gray quartzite and it measures 2 3/16 inches (5.5 cm) long. Kimberley points are Australia's most famous flaked stone artifacts. They were named after the semi-arid northwest region called the Kimberley Plateau. The aboriginal people living there made the first examples sometime between A.D. 500 and AD. 1000. They continued to be made until European contact and as tourists items in recent times. 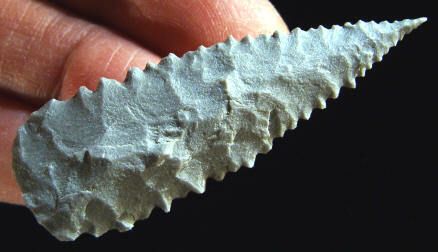 Kimberley points are projectile points that were attached to the ends of spears on foreshafts. The foreshafts measure between (3 feet 3 inches to 4 feet 11 inches ( 1 and 1.5 meters) long and the spear shaft measured between 4 feet 11 inches to 6 feet 7 inches ( 1.5 and 2 meters) long. The point was hafted into a notch with resin that was usually obtained from porcupine grass. The resin was heated and applied for several centimeters down the foreshaft. No other hafting material was used. Spears tipped with Kimberley points were thrown through the air with a spear-thrower called a womera. A womera is a multi-purpose tool that could be used for several different functions. It could be used to propel spears through the air, the curved wooden handle could serve as a small dish, it could be used as a fire making tool by rapidly rubbing the edge across another piece of wood and it could be used as a cutting tool when a stone adze was hafted on the end of the handle. Kimberley points were made from a variety of different cherts, chalcedony, quartzite, crystal and glass. Some of the materials are reported to have been heat-treated to make the stone easier to flake. The Worora tribe, in the northwest Kimberley region, used colorful materials of good quality to make their Kimberley points. They were using translucent orange, red, yellow and white chalcedony, fine grained quartzite that is similar to Hixton from Wisconsin and Spanish Diggings from Wyoming and even quartz crystal and milky quartz. They were also using a variety of other cherts. After European contact they began to use glass from bottles and telegraph insulators. 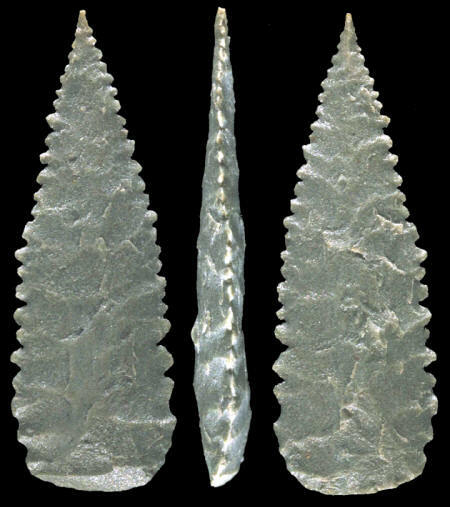 The smaller Kimberley points, 2 inches (5 cm) or smaller, were used for hunting and many of the larger examples were used for trade. Even before the Europeans arrived, Kimberley points were prized by people living as much as 1400 kilometers away for their aesthetic qualities and mythological significance. Away from the Kimberley region, they became male prestige items and were hafted onto short handles and used as knives. They were even used in ceremonial activities such as circumcision operations. This picture shows three views of this Kimberley point from northwestern Australia.